Making personal connections with as many people as possible has always been a cornerstone of conventional marketing. Despite the technological advancements that have occurred over the past couple of decades, the need for intimate and personal connections is still just as valid as it ever was. Those who wish to have a successful marketing campaign should be advised that personalized content is one of the best ways in which you can reach and make an impression upon another individual or like-minded group. We will discuss the main benefits you stand to gain by creating targeted, personalized content for specific users. It seems simple enough: if you create content that is specifically aimed at an individual, then there is a greater chance that he or she will follow through on what you have suggested they do. Much like pinging networks with your content, it will only be received positively on the other end if it is relevant and not “spammy”. Previous research suggests that a targeted marketing campaign is 60% more likely to lead to a conversion with an individual who is delivered personalized content versus generic, cookie-cutter content. Consider this information when you prepare to send out another generic mailing; think twice. In the past, many marketing campaigns focused on sending out as many emails as possible – with the overall goal being to hit their revenue targets. While this may have worked in the past, it is quickly becoming less efficient as people are increasingly tuning out emails that may appear to be spam. Even if they are being delivered, it doesn’t mean people are reading them. Targeted, personalized email campaigns that deliver half as many emails as generic campaigns have been shown to be just as effective. By targeting your emails to specific individuals, you can reduce the number of emails you have to send out. This will allow you to spend more time on creating specific content for your website. Strategies that focus on a general, broad theme may be able to drive traffic to their website – but what are the possibilities if the marketing campaign uses social media to reach multiple niche markets simultaneously? While email has been popular for marketing campaigns, social media is quickly catching up to the increasingly outdated concept of email. By locating individuals with specific interests and demographics that match your target audience, you can proceed to display targeted advertisements which will hopefully catch their eye. Once they are following you, this makes it easier to generate custom content for their status feed. 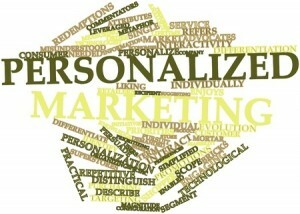 It is evident that personalized content does wonders for gaining the attention of individuals with whom you might not ever connect otherwise. Considering that the premise of social media is individuals pinging networks for like-minded individuals and content that interests them, it makes sense to apply this approach in both social media and traditional email efforts. Don’t make the mistakes of the past and continue sending out bland, one size fits all emails; connect with and get to know your audience so you can win them over with that information!